Aviva’s classmates tease her by calling her “Amoeba” and “Viva La France,” so Aviva decides to change her name to Emily. Her parents go along with her request, but after Aviva (aka “Emily”) learns about her great-grandmother Ada for whom she was named, she reconsiders. Ada came to America from “the old country,” worked in a lace factory, taught herself to read by studying newspapers, and made the best chicken soup ever. 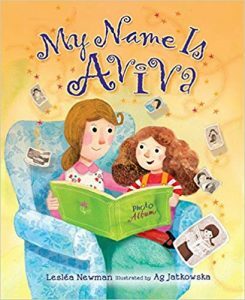 My Name Is Aviva is sure to inspire young readers to explore where their own names come from and what they mean. 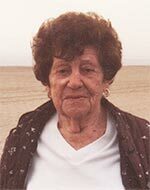 Lesléa Newman’s Grandma Ruthie (age 98), the inspiration for Aviva’s great-grandmother Ada. I was named after my grandfather, Louis Levin, whom I never met. But I heard stories about what a wonderful man he was. Like Aviva, I have an unusual name. I decided to write a warm loving story about a girl who at first dislikes her name, and then becomes proud of it. Ada is based on my maternal grandmother, Ruth Levin, who, like Ada, worked in a lace factory as a girl, studied the newspapers to learn how to read, and really did make the best chicken soup ever! (I inherited her soup pot.) I hope that after reading My Name Is Aviva, young readers will become curious about the origins of their own names. My name is Aviva, but the other kids never call me that. “Bye, Amoeba!” Danny yells as he runs past me in the schoolyard to meet his dad. “My name is Aviva, not Amoeba!” I shout, but Danny just runs on. Then Josette, who is French, skips by. “Au revoir, Viva La France,” she calls. “My name is not Viva La France! My name is Aviva,” I scream but Josette is already gone. I climb the monkey bars and hang upside down ignoring everybody. Finally Mommy and Lulu arrive. “Ready to go, Aviva?” Mommy asks. “Aviva?” Mommy taps my shouder and Lulu sniffs my knee. It’s tough to be a kid with an unusual name (unless you’re Blue Ivy Carter, perhaps). In accordance with Jewish tradition, Newman’s heroine has been named after a loved one, her late great-grandmother Ada, whose Hebrew name was Aviva. Unfortunately, it inspires her classmates to call her everything from “Amoeba” to “Viva La France.” Henceforth, Aviva wants to be known as Emily. Her parents play along, but they also make sure Aviva understand her name’s backstory: how Ada immigrated to America as a child, worked in a lace factory at age 10, taught herself English, and made chicken soup “so delicious, everyone told her to open a restaurant.” Aviva realizes that her name has a more profound meaning than she ever imagined—it connects her not only to her faith traditions but also to a woman who was “brave and smart and talented and kind.” Jatkowska’s upbeat characters have an oddly wooden, doll-like quality, but it doesn’t intrude on Newman’s storytelling, which is characteristically empathic, soulful, and wise—not to mention a great lead-in to discussions about readers’ own names. Aviva is tired of being teased about her name. At school she is called “Viva la France” or, even worse, “amoeba.” So she takes matters into her own hands and decides to change her name to Emily. Her mother takes the change in stride, calling her daughter Emily as they make chicken soup together, read a book, and look at the stars. All the while, Aviva/Emily’s mom tells stories of her own grandmother Ada, who taught her to cook, to sew, to read, and so much more. At bedtime, the little girl finally asks, “why did you name me Aviva, anyway?” Her parents explain the Jewish tradition of naming a baby after beloved family or friends who are no longer living. Grandma Ada did not live to meet her great-granddaughter, but she lives on in the choice of the name “Aviva,” which was her Hebrew name. As she falls asleep, Aviva decides that she is indeed Aviva, proud of her name and her heritage. Many Jewish children are curious about the origin of their names, and wonder why they are unusual or old fashioned. Newman’s clear and rich narrative explains the custom with warmth and appreciation for tradition. The illustrations, depicting both past and present, are a bit cartoonish for the quality of the text, but they help support the narrative. Verdict: A recommended purchase for all Judaic collections.